I'm starting to think that I should call this my What-I-Do-Instead-of-Knitting-Blog, since I keep posting about all the things that keep me from knitting rather than posting about any actual knitting. I don't know how other moms with young children ever find time to knit. I'm hoping that once the nursling gets a year or two older I'll be able to knit more often; right now she needs so much "hands on" care that daytime knitting is pretty near impossible. I yearn for the days when I can knit at the playground (and at soccer practice and swim meets and all those other places). Right now, my hands are needed elsewhere. But. What kept me from knitting today was not the nursling or even the preschooler. What kept me from knitting today was The Leaves. This is our tiny front yard. Our back yard is not much bigger. The two combined are so small that it takes DH less than twenty minutes to mow the lawn, using a non-motorized lawnmower. 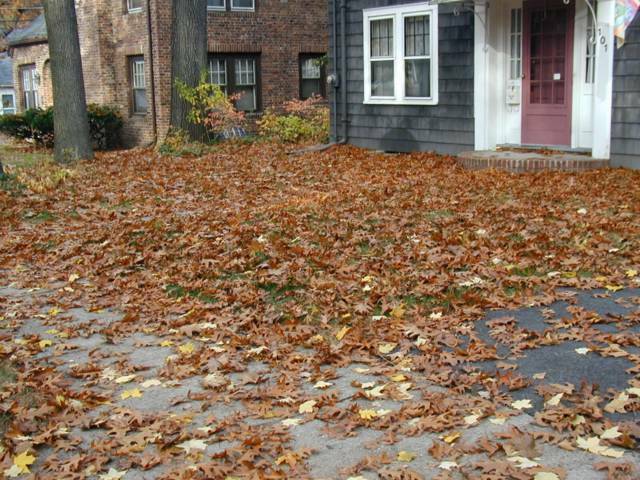 In fact, one of the things we loved about our house, when we first saw it, was that there wasn't a lot of yard to maintain. No one bothered to point out to us--giddy in our starry-eyed-first-time-home-buyer-haze--that the house has Large Oak Trees. In the front AND in the back. AND in the neighbors’ yards. 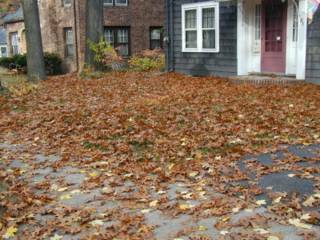 Each year those trees produce about a gazillion leaves. Because we live in the city, we need to bag those leaves, in oh, about, forty or fifty yard bags; and then we need to drag all those bags to the curb on pick-up day so that the city guys can cart them away for composting.